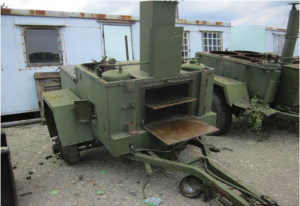 The Ovens for Peace program is now evolving in Bulgaria with the mission to transform old military ovens (metal trailers moved and used for cooking and baking) and turn them into movable wood-fired ovens to be taken to refugee camps, Roma ghetto areas, and socially marginalized institutions such as orphanages, elderly people’s homes, etc. We are currently fundraising for the remodeling of the ovens, and the mobile ovens can in the future be scaled up to a network of local social enterprises, which could particularly make use of the easily movable construction of the prototype used for the Mobile Bread House. These social enterprises could then be adapted to individual, local realities. Help us to fill some of the saddest parts of Bulgaria with joy, compassion and the smell of warm bread!